June 2011. Black Sea. Photo by E. Pavlov. Builder: Bath Iron Works, Bath, Maine, USA. Laid down date: 19 August 1987. Launch date: 23 October 1988. Commission date: 16 June 1990. Displacement ( tons ): 9750 full load. Dimensions ( metres ): 173 x 16,8 x 10,2. Main machinery: 4 x GE LM 2500 gas turbines ( 86000 hp ). Range ( miles ): 6000 at 20 knots. Complement: 400 ( 33 officers ). Guns: 2 x 1 127mm Mk45 Mod2, 2 x 1 25mm Mk38 Bushmaster, 2 x 6 20mm GE/GD Vulcan Phalanx Mk15 CIWS block1B, 4 x 1 12,7mm. Missiles: GDC 2 x 61 VLS Mk41: 122 mix of BGM-109 Tomahawk, RIM-66 Standard SM-2B, RIM-156 SM-2ER, RIM-162A ESSM, RIM-174A Standard SM-ERAM, RUM-139 VL ASROC; SSM: 2 x 4 Harpoon. Torpedoes: 2 x 3 324mm Mk32; 36 x Mk46 Mod5. Radar: Air: AN/SPY-1A, AN/SPS-49; Surface: AN/SPS-73; Fire Control: AN/SPQ-9A; 4 x AN/SPG-62 target illumination; TACAN: AN/URN-25, IFF Mk12 AIMS AN/UPX-2. Sonar: AN/SQQ-89 combined with an active hull sonar AN/SQS-53A, AN/SQR-19 TACTAS. 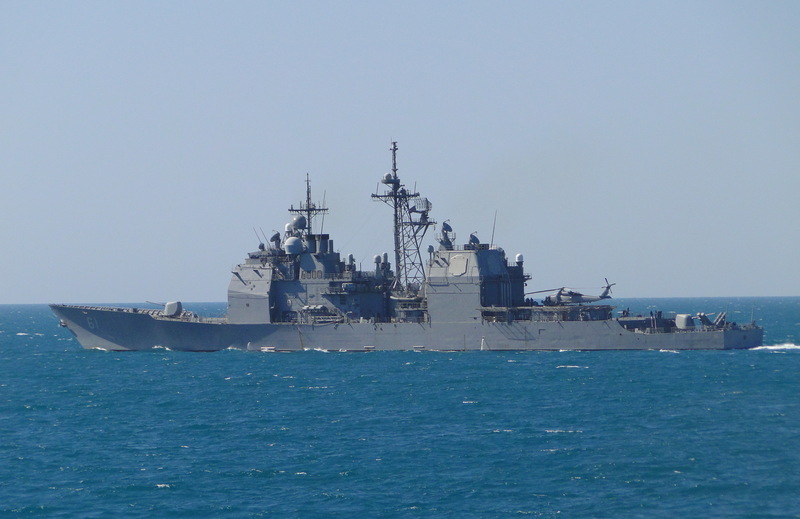 Countermeasures: Decoys: 4 x SRBOC Mk36 launchers; Towed torpedo decoye AN/SLQ-25 Nixie; ESM/ECM: AN/SLQ-32V(3). 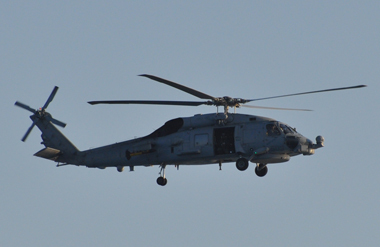 Helicopter: 2 x SH-60B Sea Hawk LAMPS III or MH-60R. SH-60B Sea Hawk organic helicopter on board the USS Monterey.